NEXT | Know Your Lore: The Shal’dorei, a playable race? Welcome to episode 58 of Lore Watch! Lore Watch is a podcast that explores a single lore subject about the World of Warcraft, Diablo, Overwatch, or any other games that interest us. Join hosts Anne Stickney, Matthew Rossi, and Joe Perez for an in-depth look at the evolving stories of the games we all love. 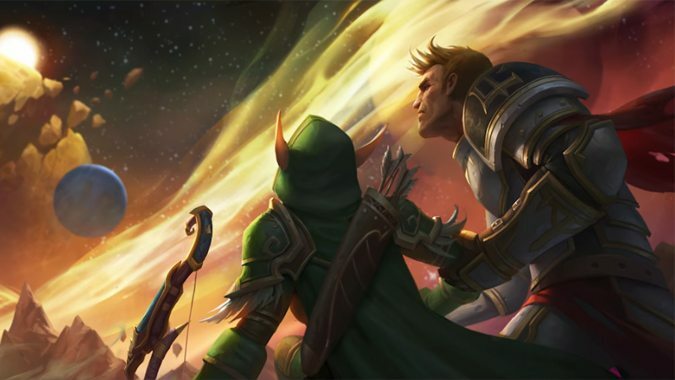 This week our Lore Watchers Anne, Matt, and Joe take a look at Blizzard’s latest audio drama, A Thousand Years of War. In between discussing the finer points of Alleria and Turalyon’s fate, they delve into the contrast of Light and Void. It’s an extra-long episode of lore and speculation of cosmic proportions! If you like the show and you’d like to know more about Blizzard’s lore, Audible is offering a free audiobook download when you sign up for a free 30-day trial. Audible has a wide variety of Blizzard’s titles available to enjoy, including Tides of War, Dawn of the Aspects, Wolfheart, Illidan, and many more.